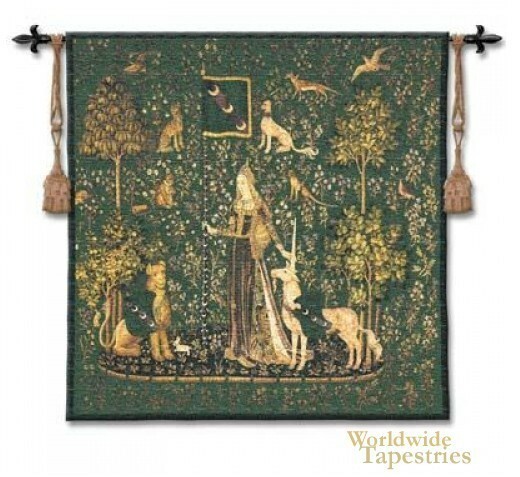 This tapestry "Sense of Touch - Emerald" shows a scene portraying the sense of touch inspired by the series of tapestries "Lady and the Unicorn". This emerald version is dark and shows the medieval feel of the work very well. The mille fleur background shows the trees, flowers and creatures decorating the background. This unicorn tapestry "Sense of Touch - Emerald" is backed with lining and tunnel for easy hanging. Tapestry rod and tassels, where pictured, are not included in the price. Dimensions: W 53" x H 56"